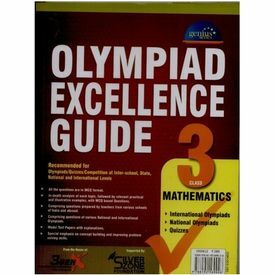 Olympiad Excellence Guide - Mathematics, published by 3GenX India, is a comprehensive book for Class 3 students, who are preparing for the International Mathematical Olympiad. Along with solutions provided to the previous years' question papers, and in-depth analysis of each topic followed by an illustrative and practical set of questions, this book is the perfect start for young readers who would want to excel in National and International Mathematics Olympiads. 3GenX publishes Olympiad Excellence Guide for students from Classes 1st to 10th. These books are highly recommended for superior performance in the Olympiad at all levels. Their books are tailor-made as per the latest syllabus of Olympiad and conform to CBSE/ICSE and State Boards. Olympiad Excellence Guide - Mathematics (Class - 3) Olympiad Excellence Guide - Mathematics, published by 3GenX India, is a comprehensive book for Class 3 students, who are preparing for the International Mathematical Olympiad. Along with solutions provided to the previous years' question papers, and in-depth analysis of each topic followed by an illustrative and practical set of questions, this book is the perfect start for young readers who would want to excel in National and International Mathematics Olympiads. About 3GenX 3GenX publishes Olympiad Excellence Guide for students from Classes 1st to 10th. These books are highly recommended for superior performance in the Olympiad at all levels. Their books are tailor-made as per the latest syllabus of Olympiad and conform to CBSE/ICSE and State Boards.